On Wednesday, the pair lost about 90 points. The US dollar fell amid a slowdown in the growth in the Producer Price Index ex Food & Energy: the indicator showed an increase of 2.3%YoY (against the forecast of 2.7%). Investors continue to monitor the negotiations between the United States and Canada on the trade agreement, but it may take a long time before the deal is concluded. Today, investors will focus on the publication of the US Consumer Price Index Ex Food & Energy (14:30 GMT+2), as well as data on the change in the number of Jobless Claims (14:30 GMT+2). Also, traders should pay attention to the publication of the Canadian New Housing Price Index (14:30 GMT+2). The market is expected to be highly volatile. On the H4 chart, there is a downward correction, the instrument is traded near the lower border of Bollinger Bands, the price range is expanded, which indicates a possible continuation of the downward movement. MACD histogram is in the negative zone, the signal line is crossing the zero line and the body of the histogram from above, forming a sell signal. Support levels: 1.3000, 1.2980, 1.2935, 1.2900, 1.2885. Resistance levels: 1.3042, 1.3100, 1.3125, 1.3160, 1.3205, 1.3225. 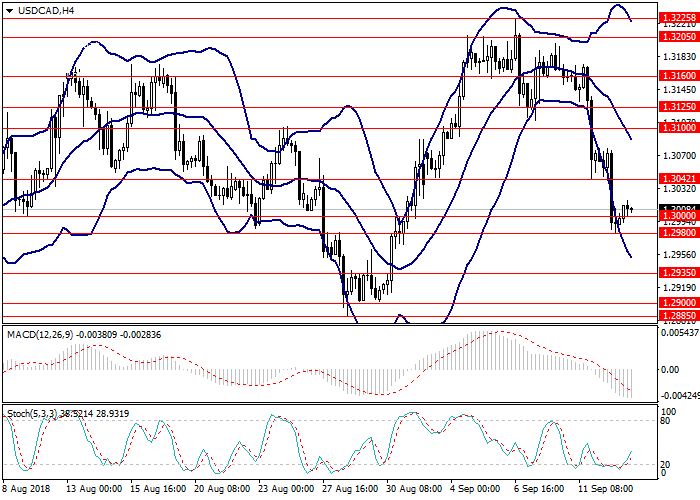 Sell orders may be opened from the current level with the target at 1.2900 and stop loss at 1.3040. Implementation time: 1-3 days. Long positions may be opened from the level of 1.3100 with the target at 1.316 and stop loss at 1.3170. Implementation time: 3-5 days.